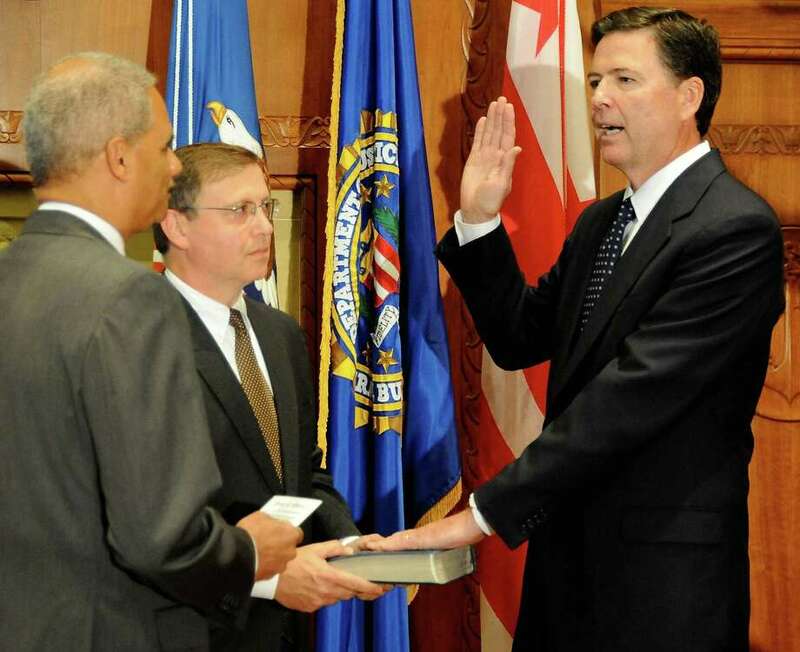 James B. Comey of Westport, right, is sworn in as FBI director Wednesday by U.S. Attorney General Eric Holder. Chuck Rosenberg, senior counselor to Comey, holds the Bible. James B. Comey of Westport, a Republican who was deputy U.S. attorney general in the George W. Bush administration, was sworn in Wednesday as President Obama's choice to be the FBI director. In a ceremony at the Department of Justice in Washington, D.C., Comey became the seventh director of the FBI. The oath of office was administered by Attorney General Eric Holder. "I know Jim brings an impeccable sense of judgment, a commitment to innovative methods and tools, and a lifetime of experience to this new role -- which is critical to the protection of our nation and its citizens," Holder said during the ceremony, according to a statement issued by the FBI. "As a seasoned prosecutor, a proven leader, and a faithful advocate for the American people -- and for the rule of law -- I am confident that Jim Comey will continue to uphold the standards of excellence and integrity that the FBI's outgoing director, Bob Mueller, helped to establish." Comey, who until earlier this year was general counsel for the Westport-based hedge fund, Bridgewater Associates, was nominated by Obama to be FBI director in June. The Senate confirmed his nomination in July. Comey succeeds Robert S. Mueller III, who served as FBI director for 12 years. "I, James B. Comey, do solemnly swear that I will support and defend the Constitution of the United States against all enemies, foreign and domestic; that I will bear true faith and allegiance to the same; that I take this obligation freely, without any mental reservation or purpose of evasion; and that I will well and faithfully discharge the duties of the office on which I am about to enter. So help me God." He and his wife Patrice are the parents of five children. After leaving Bridgewater in February, he joined the Columbia University Law School as a senior research scholar and Hertog Fellow on National Security Law. The Comeys apparently plan to maintain a home in Westport.